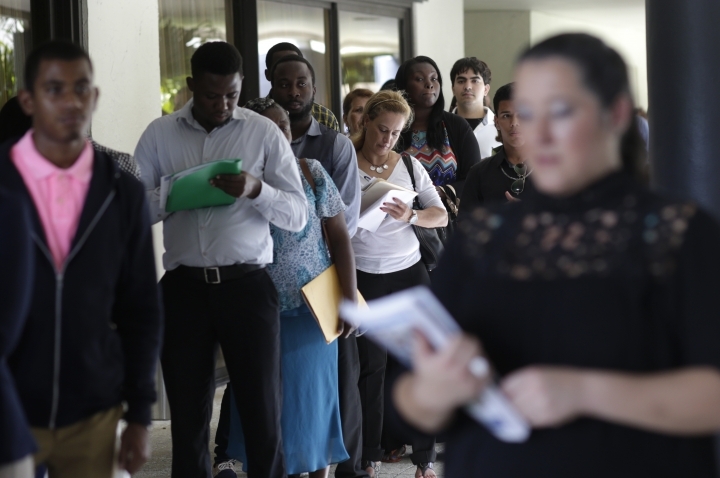 WASHINGTON — Slightly fewer people filed for U.S. unemployment benefits last week, a sign the American job market remains healthy. THE NUMBERS: The Labor Department said Thursday that applications for jobless aid slipped by 1,000 to a seasonally adjusted 261,000. The less volatile four-week average dropped by 1,250 to 264,000. Overall, the number of people receiving unemployment checks fell by 30,000 to 2.15 million, down 5 percent from a year earlier. THE TAKEAWAY: Applications are a proxy for layoffs. They have remained below 300,000 for 77 straight weeks, longest streak since 1970. The current reading is even more impressive because the population has grown considerably since then. Ian Shepherdson, chief economist at Pantheon Macroeconomics, suspects the flooding in Louisiana will put some people out of work and send unemployment claims higher over the next week. Overall, he says, "employers remain fundamentally optimistic over the economic outlook." KEY DRIVERS: The U.S. unemployment rate is 4.9 percent. Employers added 255,000 jobs in July and 292,000 in June. Hiring is strong even though the economy has registered lackluster growth since late 2015. The economy expanded at an annual pace of 1.2 percent from April through June after growing just 0.8 percent in the first quarter and 0.9 percent in the fourth quarter of 2015. Solid hiring amid slow growth is worrisome. It shows that the economy is less productive, with more workers needed to produce the same or slightly more output. Productivity, or the amount of output per hour, has dropped 0.4 percent over the past year. Weak productivity growth could hobble the U.S. economy and keep a lid on pay gains. Greater productivity allows companies to boost workers' pay without raising prices.